On April 21, 2002, Indiana University's International Vocal Ensemble (IVE) will perform Azeri folk songs at its Spring Concert in Bloomington. Renowned Azerbaijani pianist Chingiz Sadigov, who now lives in San Francisco, will accompany the group. Dr. Mary Goetze, Professor of Music and Chair of the University's Music in General Studies Department, is the director of IVE; she formed the choir in 1995 to explore non-Western musical traditions. So far, the IVE has performed music from various countries, including South Africa, India, Japan, Israel, Venezuela and Tibet. The choir sings each song in its native language, re-creating the music and movements of the tradition. Most of the group's 54 members are undergraduate and graduate music students. When I first met Dr. Goetze in February 2000, she was already intrigued with Azerbaijan's musical traditions. 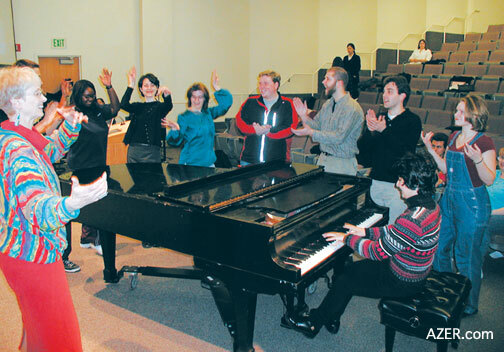 In June 2000 she included Azerbaijani songs in the Multicultural Music Education seminar in Bloomington; two months later, she was on her way to Baku. When she heard of my upcoming one-year residence in Bloomington, she decided that it would be a great chance for IVE to learn Azerbaijani folk songs. Starting in January, we have been rehearsing twice a week for two hours each session. The choir has worked on three popular folk songs: "Bari Bakh" ("Hey, Look At Me", arranged by Rauf Babayev), "Ay Gulabatin" (arranged by Ramiz Mustafayev) and "Gul Achdi" ("Flower Blossomed", arranged by Jahangir Jahangirov). Katherine Domingo, the choir's Assistant Director, noted that the students picked up the melodies and rhythms fairly quickly. "The songs are so melodic, rhythmic and a lot of fun to sing," she said. "I think they'll stick in our memories long after the semester ends." Pronouncing and memorizing the text has been much more difficult. "This is probably the most challenging aspect for us, since the vowel sounds are somewhat unfamiliar," admitted Dr. Goetze. Above: Students from Indiana University have been learning to perform three traditional Azerbaijani folk songs for an upcoming concert. Dr. Mary Goetze directs the group while Aida Huseinova accompanies. We've also spent time introducing Azerbaijani culture to the students and listening to other music from Azerbaijan. We've seen Dr. Goetze's slides and videos of Baku, including a video of the youthful Bari Bakh Group performing their signature song. It's wonderful to see how the music of my country is being appreciated on the other side of the world. Aida Huseinova, who has a Ph.D. in Musicology, teaches music history at Baku Music Academy. In 2000 she spent a semester in Bloomington as a participant of the Baku State-Indiana University Exchange Program. She currently has a one-year residence there as an American Council Junior Faculty Development Program Fellow. Contact: anhuseynova@yahoo.com. The IVE concert will be held April 21, 2002 at 4 p.m. at the campus's Auer Hall. Contact: bravo@indiana.edu. To learn more about IVE, visit www.indiana.edu/~ive/index.htm. To read the English or Azeri Latin lyrics of "Bari Bakh", "Ay Gulabatin" and "Gul Achdi", visit AZERI.org; click on LATIN SCRIPT and then MUSIC LYRICS. All people around would approve it!